Gaming is a way of life for the family at C.P. Dean! While we are best known throughout Virginia for new pool tables, trophies/awards and billiard service, we also have decades upon decades of helping homeowners like you choose the best ping pong table to fit your needs, budget and space! Throughout the world KETTLER is a leading brand in leisure furniture, fitness equipment, table tennis tables, bicycles, and children’s outdoor toys. In 1949, a young Heinz Kettler started a small enterprise in his hometown of Ense-Parsit, Germany. Since that time, KETTLER has grown from a small factory into a world-wide manufacturing and marketing organization employing over 1500 people. KETTLER products are now sold in over 60 countries around the world. Even after 60 years of growing, KETTLER continues to manufacture products in Germany and the company is still owned by the same family. What do all these products have in common? Our products are designed to contribute to the well-being and fitness of our customers, young and old alike. Our employees develop, produce, distribute and service KETTLER’s innovative and high quality products. The most important part of our success is our customers who have supported us for over half a century. Take your table tennis matches outdoors with the KETTLER Stockholm GT Outdoor Table Tennis Table! The outdoor table comes with a fully weatherproofed aluminum composite tournament style table top, coated with a water based UV, scratch and fade-resistant paint. An ALU-TEC climate-control underside controls table expansion and contraction due to weather changes. Superior locking mechanisms provide improved security and trouble-free use. Tournament style lines are smooth and even for better play and truer bounce. The table can be used for warm ups or solo play thanks to its true play-back feature which also eliminates any gaps. When not in use, the table easily folds for compact storage. A 1” aluminum apron prevents the table from warping to keep your games going for years to come. Add some fun to your backyard gatherings with the KETTLER Stockholm GT Outdoor Table Tennis Table! Also available for indoors. The German made KETTLER Champ 3.0 Outdoor Table Tennis Table is a world class table loaded unique and safe specifications. It features a sealed aluminum composite non-glare tournament top built to be absolutely waterproof even under the toughest conditions. 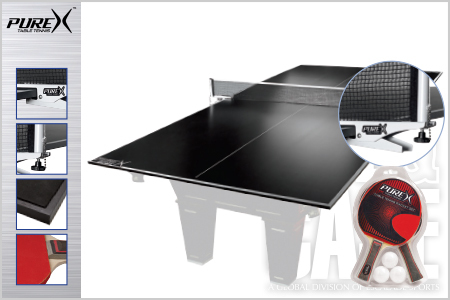 This resilient game table includes a UV and fade-resistant topcoat and certified tournament bounce as well as an amazing 1.5in thick aluminum apron that ensures the table top will not warp. Patented locking mechanisms offer improved security and trouble-free use. The German engineered Champ 3.0 also features 2.5in swiveling transport wheels with integrated locking systems for safety and ease of movement. The true playback feature offers the opportunity for warm up or solo play and the patented space saver technology allows for easy transport and compact storage. The Champ series easy to assemble and comes backed by the manufacturers 5-year warranty. It also includes an attached racquet and ball holder designed into the side of the table for your convenience. The KETTLER Champ 3.0 Outdoor Table Tennis Table unites rigid German construction with innovative design for superior, long-lasting performance. Also available for indoors. 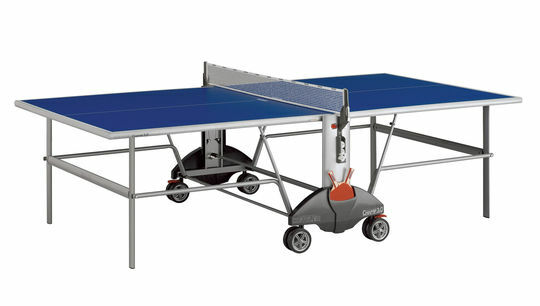 Add a little excitement to your family game night with a PureX® Table Tennis Conversion Top. This professional grade conversion system transforms your standard billiard table into a regulation ping pong table in seconds! Each kit comes with everything you need to play – competition-style net, paddles, extra balls and center support blocks. Replacement competition net & clamp also available.